Sitting at the rear of your work surface, glass splashbacks are designed to protect kitchen walls against moisture, heat and food debris when cooking. We’re not just talking about the obvious spots that you clean up after each session either; the tiny water molecules that would otherwise seep into the wall unseen can cause structural damage over time. Due to their protective nature when it comes to moisture and heat, glass splashbacks are ideal for use in bathrooms too. Glass, naturally, is a fantastic material for splashbacks. The protection offered by a good splashback, can in the long run, save you considerable amounts of money in remedial building costs. And with an endless array of colours and designs available out there, we’re certain you’ll be able to find one to match your kitchen or bathroom. But not everyone is familiar with what they’re all about, so we at KLG Glass wanted to answer some of your questions. So, let’s explore splashbacks in a little more detail and discover how they’ll benefit your home. How are Glass Splashbacks Made? 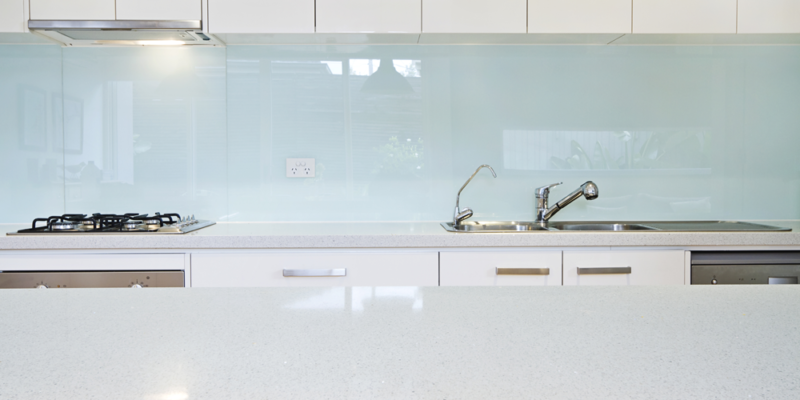 Glass splashbacks are made from toughened glass – or tempered glass as it’s often known. Glass of this sort is heat-treated for additional strength. It’ll therefore be able to absorb a bit more punishment and heat before they break. Toughened glass is around five times as strong as normal glass, and, since the exterior is at a slightly different tension to the core, it’ll shatter into tiny, blunt fragments as opposed to shards if it’s smashed. This makes it a safe choice as well as a stylish one. Is it Possible to Cut a Glass Splashback? While it’s possible to cut into tempered glass, we wouldn’t recommend it. Once your saw passes through a certain point, the tension between the interior and exterior of the glass will instantaneously resolve – causing it to shatter. In other words, do not cut into your splashback. In doing so, you will ruin it! We would always recommend having a tempered glass splashback made-to-measure, this will eliminate any sizing issues and mean that you’ve got exactly the right size for the space it’s designed for. Can Glass Splashbacks be Used with Gas Hobs? Glass splashbacks will work perfectly well with gas hobs, provided that there’s a decent gap between your hot pots and pans and the surface of the glass. As a general rule of thumb, this should be 110mm or more, as measured from the rear of the hob. Repeated cycles of heat and cold will cause the glass to crack, so it’s best to keep the distance between the two as wide as possible. A gas hob also requires plenty of space on either side. So if you’re looking to install one in a chimney breast for example, 300mm from each wall is a recommended minimum when installing alongside a glass splashback, but for best results you should consider 500mm or more. You’ll also need to be sure that there’s a little space in front so that passers-by aren’t at risk of knocking pots and pans off. If you can’t accommodate your hob without a decent gap around the front, back and sides, then it’s time to consider a smaller hob. How are Glass Splashbacks Fitted? Before you even think about installing your splashback, you’ll need to measure up. This means deciding exactly where the splashback is going to be by accurately recording where the cupboards, cooker hoods, sockets and switches are going to be fitted . You’ll need to leave a little bit of room for marginal error here, since altering the size of the glass after it’s been tempered will be impossible. You can fit your splashback in one of two ways. If you elect to secure your splashback with screw fixings, then ensure that the appropriate holes are drilled before the glass is tempered. You should also be careful not to over-tighten the screws, as doing so will risk damaging the glass, which could cause it to crack later down the line. Screw fixings will always be visible, and thus you’ll need to position yours carefully if you want to disguise them. Using adhesive fixings is more straightforward. There is no need to drill any holes, and there will be no visible fixings. Simply apply the silicone based glue to the rear of the splashback and support it against the wall until the adhesive dries. Given that glue produces a seamless, attractive finish, it’s the approach preferred by many homeowners. Can a Glass Splashback be Fitted Over Tiles? What if you’d like to combine the look of a tiled splashback with that of a glass one? Or what if you already have a tiled splashback in place, but you’d like to install a glass one over the top? There are a few things to consider before attaching a glass splashback to a tiled one. Firstly, note that doing so will create a splashback that’s effectively twice the thickness, which will slightly limit the space available and may mean that your splashback protrudes in places. This will be especially noticeable around your sockets, which might need to be re-fitted. Secondly, you’ll need to ensure that the tiled splashback is adequately fixed to the wall, as the existing glue will effectively bear the weight of two splashbacks. We would always recommend the complete removal of any previous splashback (tiled or otherwise) before affixing a new one. This will ensure the walls can be fully prepared before fixing and you don’t run any risk of miscalculating sizes. How do You Clean Glass Splashbacks? One of the crowning virtues of the glass splashback is that cleaning them is pretty much effortless. It is, after all, a smooth sheet of glass! With that said, a glass splashback will be expected to be subjected to a punishment of a different sort to, say, a window. It might become spattered with grease, oil and limescale so will need slightly different cleaning methods. Glass splashbacks do not respond well to abrasive cleaners. Don’t use wire wool or brushes with plastic bristles. Instead use a small amount of gentle glass-cleaner and wipe it with a damp cloth. Allow it to dry gradually, out of direct sunlight. This will reduce the appearance of visible streaks. If you don’t have any window cleaner to hand, then try a combination of water and distilled vinegar. This will break apart grease molecules, allowing your cloth to lift them away. Use a soft, dry cloth to remove any excess and reduce smears. As with most domestic chores, it’s best to clean your splashback little and often. Don’t allow grease and dirt to accumulate as this will obviously make it more difficult to get good results each time. A glass splashback makes a fantastic addition to the kitchen. Coming in a range of different colours, they’re adaptable, easy to maintain, and effective. What better way could there be to protect your kitchen walls from all of those bubbling stews, boiling pastas and sizzling stir-fries?